I was just wondering if you HAVE to consume food/energy bars (and what not) or if over a period of time you will get energy like other Facebook type games, such as for instance how you receive more lives in Candy Crush after a period of time. your energy regenerate . 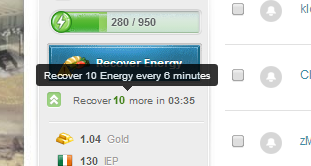 Hover your mouse over the energy bar and a tooltip will show you the rate. This week its 10 energy each 6 minutes. Edited by Releasethe Krakken, 11 February 2014 - 12:58 PM. As you can see on the screenshot above, the energy indicator shows a normal green(which is the energy you have at that time) and a little bit of light-green after that which is the amount of energy you can recover by consuming food. If the energy indicator is completely or only for a part blank(no color) you can only recover energy by consuming/using energy-bars(which are easily recognized by their orange color). Hi Guys! Why i have the energy bar full green but haven't energy? 0/480? In the green bar it says "buy food". Meaning you don't have the resources needed to recover your energy. Question: Why Can't I Work In My House Company?